Europlaz have developed a range of roller clamps to meet our own demand and also to sell to third parties. There are two sizes of clamps, the smaller clamp, code ‘SRC001’, fits 6.8mm (0.268 inch) OD tubing. The second clamp fits larger tubing with a diameter of 9.6mm (0.374 inch) OD tubing. Code for the larger size clamp is ‘LRC001’. Both roller clamps are available immediately with high volume capacity. Europlaz is a medical device manufacturer already serving global markets with varied, high specification medical devices. The clamps are available in any colours, subject to discussion. Please contact katy.okeeffe@europlaz.co.uk for a quote price and samples. Here are a selection of photographs of new machinery in cleanroom three at the Europlaz manufacturing site in Southminster, Essex. Europlaz have been investing heavily in new equipment over the past two years following the major investment in our newest class 7 cleanroom. Here you can see a new Faro Gage Plus machine – a portable measurement arm offers accuracies up to .018mm and a 1.2m working volume. This has allowed us to replace any cluttered inspection area with one tool that can accurately do it all. For a full list of machinery and our capabilities please feel free to contact us on 01621773471..
You can also follow @Europlaz on Twitter for regular news & updates. In this picture you can see the 300 Tonne Injection Moulding machine at work – this is one of the largest injection moulding machines currently in a cleanroom in the UK. 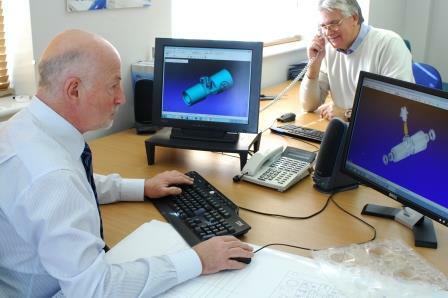 Europlaz has over 40 years experience of technical and medical injection moulding. Hot Plate Welder within cleanroom 3 - Used to weld micro wire on specialist medical devices - medical manufacturing. This is a real piece of kit – the hot plate welder uses a robotic arm and microscopic measurements for the most accurate medical device manufacturing. Europlaz are always keen to show off our site and cleanrooms so please call to organize a site visit if there is something you wish to discuss.